eLSi is a European "Transfer of Innovation" project, financially supported by the European Commission within the Leonardo da Vinci programme. Life science is a key sector in Europe, comprising pharma, biotech, medtech and healthcare. The life science industry is a global business, with collaboration partners and target markets distributed world-wide and with strong international competition. There is therefore a growing need of European life science managers to acquire the key competence of specific intercultural skills in order to export their company's expertise, to collaborate with key global players and to sell their technologies into international markets. Especially in the life sciences, SMEs need to act internationally from the very start and risk failure if they cannot compete on the global market. Experts state that only 10% of biotech start-ups succeed in the long run and that many SMEs are losing business opportunities due to the lack of business culture skills. The eLSi project focuses on such gaps in culture skills that hold back life science companies in their internationalisation to non-European regions. Through the creation of language & culture training resources, the eLSi project wants to contribute to a successful increase in the global competitiveness of European small and medium-sized enterprises in the life science sector, with a focus on non-European target countries. The training materials are aimed at SME managers who are involved in the internationalisation process of their company. eLSi will transfer existing training tools from a previous Leonardo da Vinci project, combine them with new life science focused materials and transport them to the target groups using electronic teaching tools. These modern and flexible e-learning modules will focus on eight target countries/markets most relevant for life science business outside Europe. The results of the project will be made directly available to the target group in Europe, taking into account their cultural and linguistic diversity. In addition, Vocational Education Trainers (VETs) and institutions will be offered the opportunity to integrate the valuable sector-based culture resources into their training programmes for life science professionals, especially into those with an international context, e.g. for skills in business development. The impact of the new project will be the ability of European SMEs to 'read' cultural business situations such as negotiations, bench-to-bench collaborations, meetings and relationship-building, and to prepare them for the life science sector in the non-European target country, thereby enhancing business opportunities abroad. 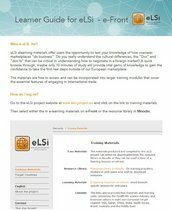 The complete database of the eLSi materials has been transferred from the original, closed Moodle platform hosted by LMU Munich to a this website for free public use thanks to the funding support of the bioXclusters plus project.